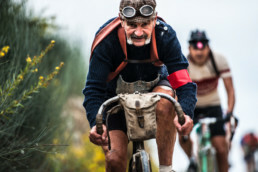 L’Eroica is not just one Sunday in Autumn, nor is it solely the biggest hap- pening in the world of vintage cycling. L’Eroica is year-round with a permanent itinerary to cycle and enjoy alongside the changing colors and tastes of the seasons. You can start the course from any point on the circuit. 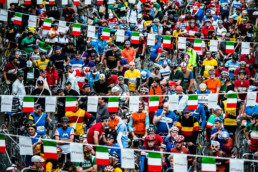 Cyclists who wish to complete it in its entirety, breaking it into di erent stages, and to receive a formal certi cation of “heroism on pedals” may request a road book and the stamps that attest to the completion of the ve zones: Chianti, Siena and the Val d’Arbia, Montalcino, the Val d’Orcia and the Crete Senesi. Gaiole in Chianti, the “capital” of l’E- roica, is a historic village built around a piazza named a er the Baron Ricasoli, a winemaking pioneer in Italy. The circuit’s first destination is the Brolio Castle, the “Ricasoli home,” with its adjoining wine cellars where the Chianti Classico was baptized. The ride to the old manor leads up through the cypresses, skirting the old walls before descending and “meeting” the first strip of dirt road that runs through the velvet-like vineyards. The spectacle of Siena from a distance, with its red stone and red towers, is alone worth the e ort of cycling this stretch along the white roads. With the piazza del Campo and the Duomo behind you, the route rises and falls through the hills of the Val d’Arbia, past farmhouses and tiny villages before reaching Buonconvento, a historic junction along the via Cassia. The permanent route measures 204 kilometers in length, with an elevation pro le of 3,370 meters. The ideal bike is a hybrid with gears with dirt road tires. Splitting the itinerary into 4-5 stages is recommended. The steepest inclines are between Bibbiano and Montalcino and on the slope of Mount Sante Marie along the stretch that links Asciano and Castelnuovo Berardegna. The road to Montalcino, the next destination, rises towards Castiglione del Bosco surrounded at first by golf courses, then by the heart of the forest, where the inclines can become severe, but no one will penalize you for putting a foot on the ground to help push your bike. Montalcino, a noble sanctuary of fine wine, awaits you for a pause in the shade of its mighty fortress. The Val d’Orcia (UNESCO Site), from Torrenieri to Lucignano d’Asso, is a spectacle for the eyes and the soul with its rolling hills dotted with farmhouses, sun ower fields, oak trees and more vineyards. The green horizon slowly gives way to the almost lunar landscape of the Crete Senesi, amidst cli s of white clay, ravines and clusters of pointed cypresses to mark the farms on the ridges. Just beyond Asciano, the slope of Mount Sante Marie propels you towards Castelnuo- vo Berardenga and back into Chianti along a spectacular downhill glide into Gaiole, where even those who finish towards the back raise their arms to celebrate their heroic feat.